From time to time, our NumbersUSA activists share with us the letters they receive from Members of Congress in response to a message they sent from their Action Board. In recent weeks, lawmakers, especially Democrats, have been telling our activists that the number of border apprehensions is down compared to past years, so there's no crisis and no reason for additional border security or changes to the asylum system. But focusing solely on total apprehensions misses the point. The chart below details the recent 6+ year history of apprehensions along the Southern border. The full bar, including the green, blue, and red sections, shows the total number of apprehensions for each fiscal year. The number in FY 2018 was lower than 3 of the other 6 years displayed, but it still represented a 31% increase over the previous year. 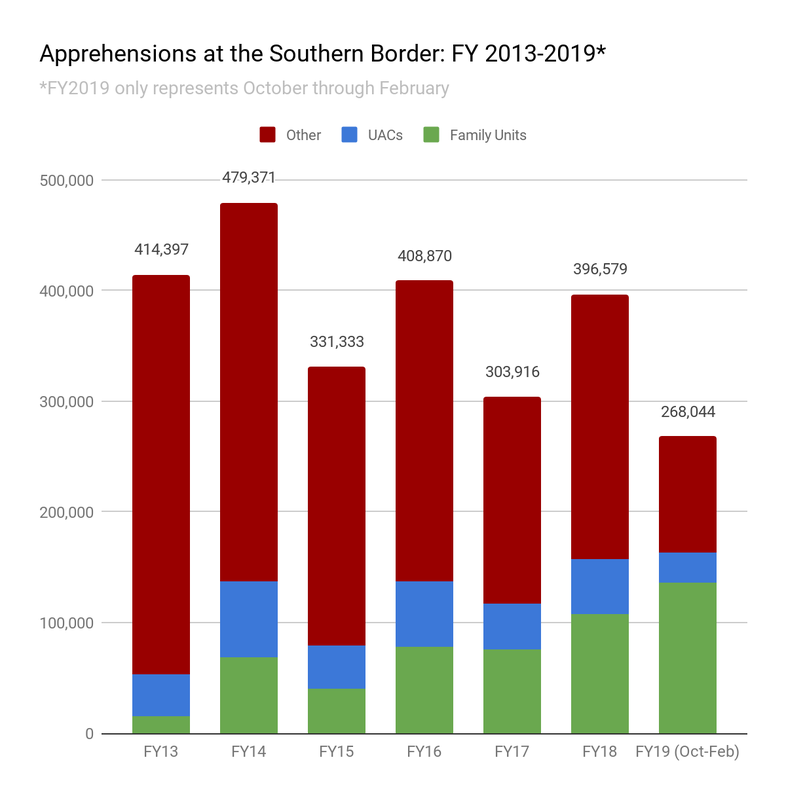 More concerning, the Border Patrol has reported more than 268,000 total apprehensions through the first 5 months of the current fiscal year, FY 2019. If that trend continues, total apprehensions will exceed 600,000 in FY19, blowing past any of the previous 6 years. Some will argue that apprehensions are seasonal, and that's true. But we've already seen a 43% increase in FY19 compared to the same time last year. That still puts us on pace for more than 566,000 apprehensions. More importantly, the chart details the steady increase of apprehended Family Units over the years. This is indicated by the green section of each bar and broken down in the table below. The apprehension of Family Units over the first 5 months of FY 2019 has already exceeded the number of Family Units in any of the prior 6 years. In fact, if that trend continues, apprehensions of family units could match, or even exceed, the total number of ALL apprehensions in FY15 and FY17. Pres. Trump remains fixated on a border wall, but, as NumbersUSA has argued countless times, a border wall won't end the crisis. Yes, additional barriers will help slow the flow ... some. The Washington Post reported this week on the 'Conveyor Belt' -- a new smuggling system used by the drug cartels to transport masses of Central American family units across Mexico to the U.S. border. Building additional border barriers, specifically in areas where roads run along the U.S.-Mexico border will help slow the flow, but it won't solve the larger issue. As the Post notes, the illegal border crossers are all taking advantage of the gaping loopholes in our immigration system by claiming asylum. The immigration courts are jammed with case backlog that's up more than 300% over the last decade. Detention centers maintained by Immigration and Customs Enforcement are full. Family Units illegally crossing the border know that with the court backlog and full detention centers, if they claim asylum, they'll be set free. Ending the border crisis starts with providing ICE with more detention space, not less, which is what they got from the recent spending bill passed by Congress and signed by Pres. Trump. Illegal border crossings will go down if the migrants know they will no longer be released into the U.S.
We also need to see a surge of immigration judges to reduce the backlog. Former Attorney General Jeff Sessions made this a top priority, but aside from some funding in the recent spending bill, there hasn't been much talk in recent months from the Trump Administration on this point. But most importantly, Congress has to finally close the 'credible fear' loophole which is driving the increase in asylum claims entered by illegal border crossers. Federal law states that anyone in the United States who fears persecution on account of race, religion, nationality, political opinion, or membership in a particular social group in their home countries be allowed to claim asylum in the United States. The first step to this process is the 'credible fear' interview, which occurs once a foreign national claims asylum. But the criteria for meeting the 'credible fear' standard during that initial interview is much lower than what's needed to qualify for asylum. This has led to the massive spike in asylum claims in recent years. Most illegal aliens who claim asylum have those claims denied by an immigration judge. In fact, 65% of the claims were denied in FY2018, and the percentage of denials for asylum-seekers from Central America was closer to 80%. Until Congress passes legislation that more closely aligns the 'credible fear' standard with asylum law, we'll continue to see individuals take advantage of this loophole. Lastly, Congress needs to make it easier to remove illegal aliens who claim asylum, but don't meet the credible fear standard. That includes reforming the Trafficking Victims Protection Reauthorization Act , otherwise known as the William Wilberforce Act, that requires unaccompanied minors from non-contiguous coutries to be treated differently than those from Mexico and Canada, and reforming the Flores Settlement Agreement that prevents the feds from detaining minors for longer than 20 days.